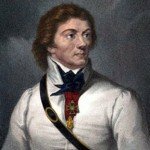 Thaddeus Kosciuszko (1746-1817) was a Polish-born military officer and engineer who served as a volunteer during the Revolutionary War. Born Andrezj Tadeusz Kosciuszko in the Polish Commonwealth (now Belarus), his family had claims to nobility but little money. Kosciuszko was educated in a military academy in Warsaw and, with the help of wealthy sponsors, completed further study in France. He returned to his homeland in 1774 but was frustrated by a lack of money, opportunities and an unpopular love affair with the daughter of a local nobleman. Kosciuszko returned to Paris in late 1775 and learned of the outbreak of the American Revolutionary War. Excited by the revolution’s liberal aims and unable to obtain a military commission in Europe, he set sail for America. Kosciuszko volunteered his services to the Continental Congress on August 1776 and was commissioned as a colonel of engineers. During the Revolutionary War, Kosciuszko served in a number of locations in both the northern and southern colonies. While he saw some service in battle, Kosciuszko is best remembered for his contributions to strategy and military engineering. The Polish colonel oversaw the placement and construction of critical defences and fortifications, as well as artillery batteries, bridges, campsites and so forth. His defensive placements thwarted British attacks at Saratoga (1777) and were a significant factor in the American victory there. Kosciuszko also constructed the impenetrable defences at West Point and contributed to British frustrations in the southern theatre of the war. After the war, Kosciuszko was honoured with American citizenship, a promotion to brigadier-general, land grants and a pension of $12,000. After collecting his payment Kosciuszko returned to Europe. He obtained a general’s commission in the Polish army (1789) and led the defence of Poland when the Russians invaded in 1792. In March 1794 Kosciuszko was appointed the commander in chief of Polish forces. After gallantly leading the defence of Warsaw, he was captured by the Russians in October. After his release in late 1796 Kosciuszko spent most of his life in exile from Poland. He returned briefly to the United States but lived out his final years in Switzerland. 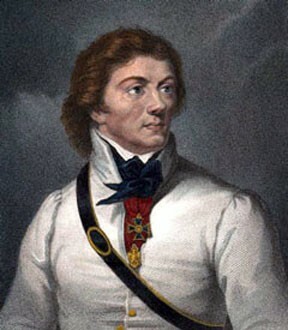 Thaddeus Kosciuszko is hailed as a revolutionary and a military hero, both in the United States and his native Poland. His name has been given to numerous towns, streets and buildings, as well as Mount Kosciuszko, Australia’s highest mountain.